Blue Devils volunteer Bill Seely, "It's important to enjoy whatever work you do especially if you're not getting paid for it." April 23-29 marked National Volunteer Week. DCI.org recently took a look at just a few of the many personalities that spend their time volunteering with drum corps. There are many drum corps out there that you can contact to find out how you too can become a volunteer. Name, hometown: Bill Seeley, Concord, Calif. Which corps do you volunteer with, how did you get started and how long have you been at it? I'm a volunteer with the Blue Devils. I got started in 2000 maintaining the vehicles because my daughter who was in the color guard wanted me to get involved. The 2001 tour was the first year I hit the road driving the Blue Devil equipment truck. 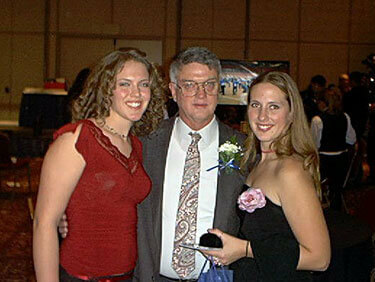 My daughter, Debbie, aged out in 2002 and her little sister, Kristy, came on board in 2003. She ages out in 2007, so I should be here at least that long. What kind of work do you do with the corps? Basically, I'm the handy man. I fix things on the road and at home. On tour and for the rehearsal camps I drive the equipment or food semi trailers. What is your favorite part of being a volunteer? I'm retired but I want to stay busy. This keeps me very busy. It also permits me to be part of my kids' lives. What is the most difficult part of being a volunteer? Scheduling. Making sure I get my other responsibilities done and still take care of my volunteer commitments. Do you have any favorite memories or anecdotes from your years as a volunteer? One of my many favorite memories was of Kristy, my youngest, when she was in the Blue Devils B corps. If she knew the "A corps" was going to be at the same show, she would run out to the entrance (in uniform) and ride in with me. I don't think she ever got caught. What are you most looking forward to during the 2006 season? Same as always, fun. I enjoy driving, working with my many friends and seeing my new friends in other corps. I believe it's important to enjoy whatever work you do especially if you're not getting paid for it. What advice do you have for those who would like to get involved as a volunteer with a corps? Take care of yourself. Don't take on more responsibility than you can handle. Even though you aren't getting paid for your time, it's important to treat your volunteer commitments as if it were a job. Failure to complete your duties can affect others on the tour. Add anything else you'd like. I think it's important that a corps have an organized and well managed volunteer program. Matching volunteers up with what they are good at is time consuming but can be very rewarding for the corps as well as the volunteer. There are a lot of people that would like to help but don't know what to do or even who to ask.